Watch my video below to see how to complete your PMP® Application so that you don’t get rejected. I’ll show you the fields that can cause problems with getting your PMP application approved. And I’ll explain why people pay to use my FastPM Wizard™ to help them avoid being rejected. I’ll also explain why you should not follow the advice of your PMP instructor or some templates they gave you for filling in your PMP application (they don’t have the experience with rejected applications that we have). Tip: You don’t actually need to watch this video if you purchase FastPM Wizard™. FastPM Wizard will guide you through everything for your PMP application and you won’t need to worry about it getting rejected — we guarantee it. But if you are still unsure, the video is only 10 minutes long and can save you many hours, days, and weeks of hassles if you have problems with your application. Tip: you can speed up or slow down this video using the settings icon in the corner of the video. Hi, Tim here. I’m a management consultant, a PMP, and I also help people get their PMP Applications approved. About half my customers need help fixing a previously rejected application and the other half just want to save time and not get their application rejected. 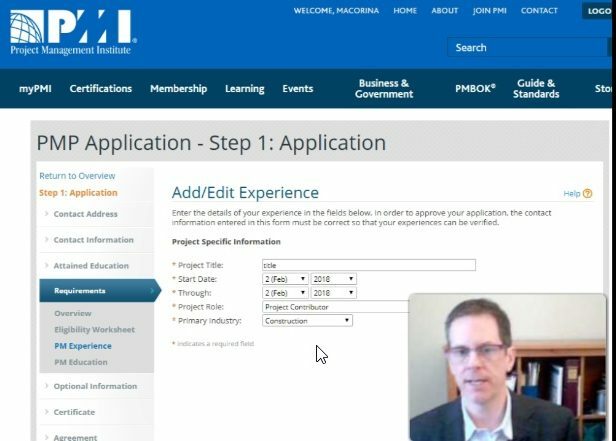 In this video, I’m going to show you how to fill in your PMP application on PMI’s website so you don’t get your PMP application rejected. I’ll show you all the fields in the application that can cause problems with your application. And I’ll explain why people pay to use my FastPM Wizard to help them get their PMP application approved (guaranteed or money refunded). So let’s go to certification.pmi.org where you can start your PMP application. You can click on Apply for PMP Credential or if you already started a draft one, you can click Continue working on PMP application. The first thing to do is enter in your contact information and click Save. These first few steps are straightforward, but pay attention when we get to the super important PM Experience part. Next, click on Attained Education and enter the highest level of education you completed and click Save. It doesn’t matter if you went to a PMI accredited program, so select No. Fill in the other parts. If your application is audited, you will need to supply a copy of your transcript or diploma that confirms this education. Now click Requirements and then PM Education. This is where you will add your 35 hours of instructor-led project management training. If audited, you will need to provide a transcript or certificate of completion and possibly a course outline or other documents. If you haven’t completed your 35 hours yet, you can leave this blank for now, but you will need to complete it before you can submit your application. Next, click Eligibility Worksheet. This is a summary of the hours and months that you will enter in the PM Experience section. Click PM Experience. This is where you enter each of the projects you are claiming towards the PMP experience requirement. I’ve created a demo project and now I’ll click on the title to show you what information you will enter. Ok, so this is where it gets tricky. Assuming you met the educational requirements, this PM Experience section is the only place in the PMP application where what you enter can raise red flags and cause the PMI reviewer to determine that your application does not qualify. In fact, almost every field in this section can cause problems in your application depending on what you enter. The reviewer at PMI will form a SUBJECTIVE opinion on whether they think you have met the experience requirements or not. If you do not know what they are looking out for, you can easily end up with a cryptic rejection email that says something like “it appeared that some of your deliverables were operational and administrative in nature rather than project-related”. Or another one of their vague reasons. “Most people don’t know the real reasons why PMI will reject a PMP application”. This includes your fellow PMPs or your boot camp instructor. Unless you have seen all the rejected PMP applications that I have, and have read all the rejection emails from PMI, you really don’t know all the countless little things that can get a PMP application rejected. Because with all the PMP applications I’ve worked with, I know what works and what doesn’t. But I can’t really explain it to you in a video or ebook, because there are so many little things in a PMP application that can cause your application to be rejected. So I created the FastPM Wizard to generate your application for you, using what you tell it about your projects. And I guarantee your application will be approved or your money-back. Ok, enough sales pitch. As we continue the application, again there are more tricky parts that seem unimportant but can raise red flags in your application. For example, does it matter who you list as your project contact or what their email address is? Yes! Yes it does matter. You can read my free PMP Application FAQ if you need more details. When you click Save and Continue, it will take you to the project hours and then the project description parts of the application. These are the riskiest parts of the application for getting rejected. FastPM Wizard is really helpful for these parts and will calculate your hours for you and help you create the wording you need to get your application approved. And it does it without requiring you to be dishonest or breaking PMI’s Code of Ethics and Professional Practice which I’m bound to, and you will be too. One of the biggest problems with people’s project descriptions is that the instructions that PMI gives at the part of experience description section can be misleading. We’ve fixed many rejected applications by ignoring these instructions and instead writing a description in the way that we’ve found that gets applications approved. Again, it’s too complicated and situation-specific to explain it here — the easiest thing is to just use FastPM Wizard. I will get your PMP application approved or I’ll give you your money back. So once you’ve entered enough projects to meet the required number of months and hours, you can click Review and Submit and it will tell you if your application is complete. In this demo, I still have a few short fields to fill out, but they are straight forward. To recap, the only part that usually causes problems with your PMP application being approved is the PM Experience section. If you are using my FastPM Wizard, it will give you the exact wording to paste into this section, based on what you tell it about your projects. Once you submit your application, it usually takes PMI 5 business days to do an initial review of your application. If you pass the initial review, they will invite you to pay your PMP exam fee. Before paying, you should purchase a 1-year PMI membership, as your exam fee will be reduced by more than the cost of membership. After you pay your PMP exam fee, they will let you know if your application has been “randomly” selected for audit. I’ll explain how audits work in a future video or you can contact me on FPMcertify.com if that applies to you. If you aren’t selected for audit, or you pass your audit, you will have one year from the date of approval to pass your PMP exam. I hope you found this helpful. If you have any comments or questions, please reach out to me on FPMcertify.com. You can also read my free PMP application FAQ at FPMcertify.com/tools or sign up for FastPM Wizard at FPMcertify.com.